From the first shots at Jumonville Glen to the surrender at Appomattox, Rebels and Patriots allows you to campaign with Wolfe or Montcalm, stand with Tarleton at Cowpens or Washington at Yorktown, or don the blue or grey to fight for Grant or Lee. Designed by Michael Leck and Daniel Mersey, with a core system based on the popular Lion Rampant rules, Rebels and Patriots provides all the mechanics and force options needed to recreate the conflicts that forged a nation. From the French and Indian War, through the War of Independence and the War of 1812, to the Alamo and the American Civil War, these rules focus on the skirmishes, raids and small engagements from this era of black powder and bayonet. Start reading Rebels and Patriots on your Kindle in under a minute. 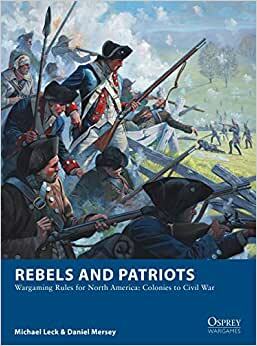 A set of wargaming rules for the battles for North America - from the French and Indian War to the American Civil War. I just received my copy that I have been waiting months for. First let me say that they are a strong 8 out of 10. Next let me say that I have yet to play them. I have read it through, twice. I own and have played both "Men Who Would Be Kings" and "Chosen Men" and can see the influence of both sets of rules. They have taken the best from those games and applied them here. Let's just say that I will continue to play "MWWBK" because of the different time period and locations. "Rebels and Patriots" may replace "Chosen Men". "Rebels and Patriots" campaigns are all North American based., which lends itself to light infantry tactics. Let's start with the few negatives. These are small issues. I don't like the officer character rules. The officer is now more like a D &D character. I can see where it can be fun, at times, and I can see ways around it. The book is poorly edited. There are a number of locations where the addition of a word or two may resolve some confusion, also the word "of" is used in a number of locations, where I believe that "off" was intended. The term used to describe the army force you build is "company". Brigade or Legion may have been a better choice. That said, on to the positives. Where "Chosen Men" has a limited list of troops and limited campaigns, "Rebels and Patriots" has a long list of campaigns to draw on. "R and P" has a limited list of troop types, such as 'Skirmishers', 'Shock Infantry', and 'Light Cavalry', but these can all be modified, both up and down. Your "company" could have a unit of green militia skirmishers and a unit of Morgan's Rifles, skirmishers with sharpshooter skills. You pay a little more for them to get them to that level. The "company" is based on 24 points. You purchase your troops to fit within that points range. Whatever North American troop types you have, there is a way to make them fit into the troop types of the game. Although the game is designed for North American campaigns, I can see using the rules to fight European campaigns. Most European troops can be easily adapted to these rules. I can also see that by doubling the available points to 48, a more European feel battle could be fought. last but not least, different troop type traits are up to the gamer. Thus, British Grenadiers in one game may be different in skills, etc., than in another, as its up to the gamers playing. This set will not have me abandoning Muskets & Tomahawks for the AWI, and will keep me looking for a good, flavorful ACW skirmish set. 4.0 out of 5 starsSimple and fun. Another well done product from osprey games. If you are into detailed simulation with lots of charts, this game is not for you. The rules are easy to learn and teach. This game work great for our club of of 6-8 players. Everyone can get a number of units to run and not be bored. Game also worked well for a 2 person game. I am enjoying playing the number of different scenarios in the Rulebook also. A well done skirmish style game.